The FBI has issued a new warning about an al-Qaida-inspired plot to assassinate key government and private sector individuals with mail bombs. The plot is only "aspirational," says a report reviewed by the Investigative Project on Terrorism. But FBI officials have expressed concern about the actions of lone wolf attackers already in the United States. The threats follow a June 3 video featuring American al-Qaida member Adam Gadahn "in which he encourages acts of individual jihad, members of several extremist Web forums posted names of companies and its leaders to target," the FBI warning said. That video appeared initially on the closed al-Qaida web forum Shumukh al-Islam. The threat has since gone viral, appearing in major forums like Ansar al-Mujahideen and Somali terrorist site Al-Qimmah. A translation of the text of the threat by the Investigative Project on Terrorism, taken from the original posting, provides more detail on the planned attacks. "The Idea – Determine lists of the names of individual actors in the Zionist-Crusader war on our Ummah [nation], from the directors of companies, supporters of the war, and media organizations that support the false propaganda, and the instigating members of Congress," states Shumukh al-Islam participant Yaman Mukhadab. "[There will be] a focus only on the most hostile countries, America, Britain, and France." 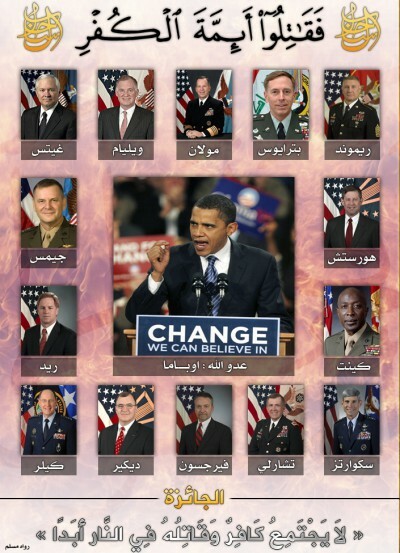 The list of names includes President Obama, along with key generals, and senior intelligence officials, as well as private counterterrorism experts like IPT Executive Director Steven Emerson and Yigal Carmon of the Middle East Media Research Institute (MEMRI). Preacher John Hagee is identified for his outspoken support for Israel, and Coca-Cola is called "proud sponsors of the 2003 Iraq invasion." The addresses of several branches of the RAND Corp., considered to be the "devil's workshop" by members of jihadi forum Ansar al-Mujahideen, also are listed. The RAND Corporation regularly figures into Islamist conspiracies about the West's War on Islam, because of its reports about strengthening moderate forms of Islam. "One should not underestimate the potential negative impact" of RAND's push for moderate Islam, notes American cleric Mohamed El-Moctar El-Shinqiti, because the company is "known to have close readership among key American political and military leaders." Although threats on prominent Americans may not be new, America's recent rash of strikes on al-Qaida figures has ratcheted up the terrorists' need for revenge. "A previous video from Gadahn in March 2010 similarly called for small attacks in the United States, but failed to have any observable significant resonance within the online extremist community," the FBI report noted. "However, UBL's death may be creating a wider or more receptive audience for AQ core propaganda messages and be a catalyst for reactions from individuals inspired by the AQ message." The recent killings of prominent al-Qaida leader Fazul Abdullah Mohammed and the reported killing of Ilyas Kashmiri have also elicited calls for revenge. Notably, the post calls for sending "booby-trapped parcels" to the residential addresses of dozens of government officials and private individuals. Al-Qaida has already recommended the use of mail bombs against American targets in the past. "$4,200" was the title of November 2010 issue of al-Qaida's Inspire Magazine, highlighting how little it cost for the group to launch major attacks through the mail. "If your opponent covers his right cheek, slap him on his left. Since 9-11 the West has been stepping up defenses for its commercial aircrafts," the magazine notes. "But what about cargo planes?" "After the operation of Brother Umar Farouk [the Christmas Day bomber] we have been experimenting with ways to bring down airplanes. We have researched the various se­curity systems employed by airports," it adds about what it calls Operation Hemorrhage. "We looked into X-Ray scanners, full body scanners, sniffing dogs and other aspects of security. The result­ing bomb was a device that we were confident that, with the will of Allah, it would pass through the most strin­gent and up-to-date security equip­ment." The magazine goes on to highlight the use of undetectable PETN explosives and al-Qaida's plan to carry out more strikes. While the bombs are focused mostly on downing airplanes, the group curses those who stop them from reaching their final targets in America. The recent threat on jihadi forums could be the fulfillment of al-Qaida's plan to expand this form of attack. "Since the two [mail bomb] operations have succeeded, it is our plan to disseminate the idea to the mujahidin worldwide and to expand its deployment onto both Civilian aircraft in the West as well as Cargo aircraft," Inspire Magazine says.